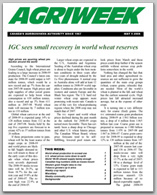 AGRIWEEK is the leading Canadian agricultural and agribusiness news and information source. 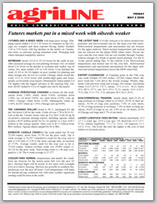 Each weekly issue brings subscribers a condensed, abbreviated summary of all the news that can affect the agricultural economy. It's essential reading for anyone who has a stake in the future of Canadian agriculture and agribusiness. Subscribers are agribusiness executives, owners, top farmers, industry organizations and government. AGRIWEEK covers agricultural and agribusiness news, crop and livestock market reports, statistics, market news and forecasts, government policy decisions. The exclusive Backgrounder commentary by publisher Morris Dorosh offers a head-on assessment of current issues and events in agriculture, agribusiness, national and international economics and society at large. ESTABLISHED IN 1967. EIGHT PAGES PER WEEK. NO ADVERTISING. SENT BY REGULAR MAIL OR E-MAIL. INDIVIDUAL AND CORPORATE SUBSCRIPTION RATES ON REQUEST. AGRILINE DAILY is the original daily commodity news and information service concentrating primarily on grains and oilseeds grown in western Canada. Reliable and timely, it is the choice of market professionals, brokers, traders, agribusiness people and top farmers who have to keep on top of fast-moving commodity developments. Includes all the news (Canadian, U.S., foreign) that can affect prices and markets for major Canadian crops. Crop and weather reports from around the world, supply and demand, key statistical reports, commodity price summary, 3-5 day predictions. ESTABLISHED IN 1990. 2-3 PAGES PER ISSUE. NO ADVERTISING. SENT BY FAX OR E-MAIL AT THE CLOSE OF EACH TRADING DAY. INDIVIDUAL SUBSCRIPTION $425 PER YEAR. CORPORATE RATES ON REQUEST.